Minimum quantity for "Push Up Drop Down Track - Singles" is 5. PUDD is the tracks or rails that hold Rigid letters, Gemini Pronto Letters and Zip Change Letters on a sign or reader board. Available in 8' and 10" long strips our rigid letter track is made from clear polycarbonate plastic. 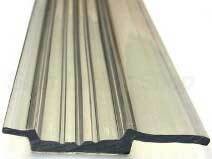 Polycarbonate is very strong and durable plastic that that will withstand harsh conditions. It can be bent, rolled and drilled without cracking or chipping. Use this track to make a reader board sign or replace/repair old tracking on an existing sign. To mount on a sign board drill a hole in the center of the track every 4 to 6 inches and anchor with screws or rivets. Each strip is a dual or middle track meaning it has 2 slots and is used for the middle strips on the sign panel. Top and bottom tracks only have on slot. Our track has a groove down the center of the track that can be scored and split to make the top and bottom tracks. To place Rigid Letters on the sign push the letter up inside the top track, push flat and let the letter fall into the bottom track. Note: Use this track with Rigid Letters, Gemini Letters or Zip Change Letters. The price is for 1 - 8' strip. When ordering enter the number of strips you need in the quanity box. Minimum order is 5 pieces.